The Validus Preparatory Academy develops students who are committed to life-long health, fitness, and learning. Validus students demonstrate the character traits of responsibility, collaboration, compassion, and commitment and graduate high school with the skills and character needed to become happy, healthy, informed, and successful contributors to their communities. All students attend school from 8:20am-2:40pm. Validus Prep is a nine-year-old small public non-charter high school dedicated to academics, health, and fitness. 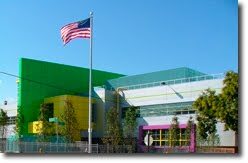 Validus Prep opened in September, 2005 with 108 9th graders. Today, we have 375 students in grades 9-12 and will graduate our seventh class this year. The school is located in a beautiful school building. NYU, UMass, University of Rochester, Howard University, The New School-Eugene Lang, University of Portland, St. John's, Colby Sawyer, Boston College, LIU, St. Joseph's, Bridgeport, Mercy College, Elmira College, John Jay, SUNY Binghamton, SUNY New Paltz, University of Vermont, University of Maryland, Syracuse, Genesee...and more! Our school offers PSAL Baseball, Basketball, Cross Country, Double Dutch, Softball, and Wrestling and club Rock Climbing, Track, Tennis, and Volleyball. Contact Athletic Director Steve Lomuscio (lomuscio@validusprep.org) for more information. For a calendar of events, click on the Parents tab to the left. See our 2014 College March on News 12. See our 2013 College March on News 12. Validus Prep was selected as an iZone 360 school. Former science teacher Jamie Munkatchy shows students how to transform ordinary liquids into biofuel. Validus Prep was given the 2009 Blue Apple Award for excellence in health education. Former Validus Principal Javier Ocampo speaks about the impact of Expeditionary Learning Schools on Univision. NY1 covers our annual March Against Violence. Validus senior T.J. Mcfarlan speaks about our partner agency, Rocking the Boat, on Channel 7 news. VPA was voted One of 10 Reasons to Love Our Country by Reader's Digest magazine. VPA students traveled to Berlin for Mock UN at JFK High School for a second straight year. Read all about it here! Validus Prep students speak about the play Our Town on CBS Sunday Morning News. Validus students talk to MSNBC prior to Obama's election. VPA presented at the Deb Meier Symposium in the spring. Read the follow-up article in Gotham Schools online! These are some of our fabulous recent graduates.